When I tell people I live in Savannah, the next words I typically hear are: “You're so lucky!” — usually followed by a smattering of questions about the best places to eat and a discussion regarding whether or not the city is haunted. Finally, good friends ask when they can visit and strangers inquire about where to stay in the Historic District. I thought it was about time I compiled a list of the best places to stay in Savannah near River Street, since it's the city's most well-known area. If you find this post about the top hotels near River Street helpful, please share it on Pinterest! FTC Disclosure: This post contains affiliate links. We may receive a referral fee from purchases at no cost to you. You can read our affiliate policy here. 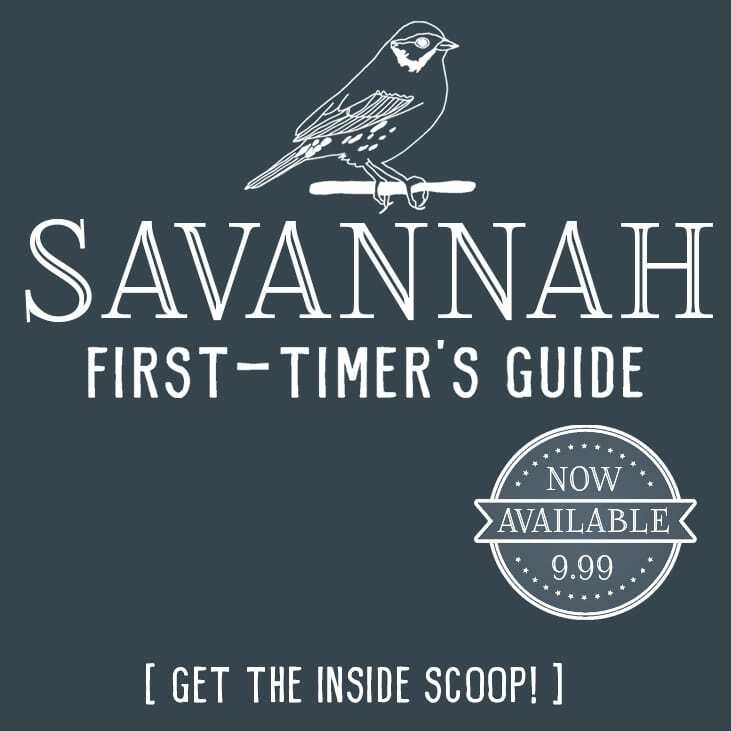 If you're visiting Savannah for the first time, I suggest purchasing my Savannah First-Timer's Guide before your trip. It's extremely detailed and loaded with helpful insider tips about the city! I realize accommodation preferences vary based on personal tastes and budget. To help your search, I've broken this post into categories of hotels, historic inns, and home rentals. Prefer to cut to the chase and know exactly where I'd stay? I don't think you can go wrong with the Marshall House or East Bay Inn or Planters Inn. TIP: No access to a car? No problem! You don't need one to enjoy River Street. Narrow your search to options to areas north of State Street — preferably between Barnard and Price Streets. It's a relatively safe area that's within walking distance to everything River Street has to offer. 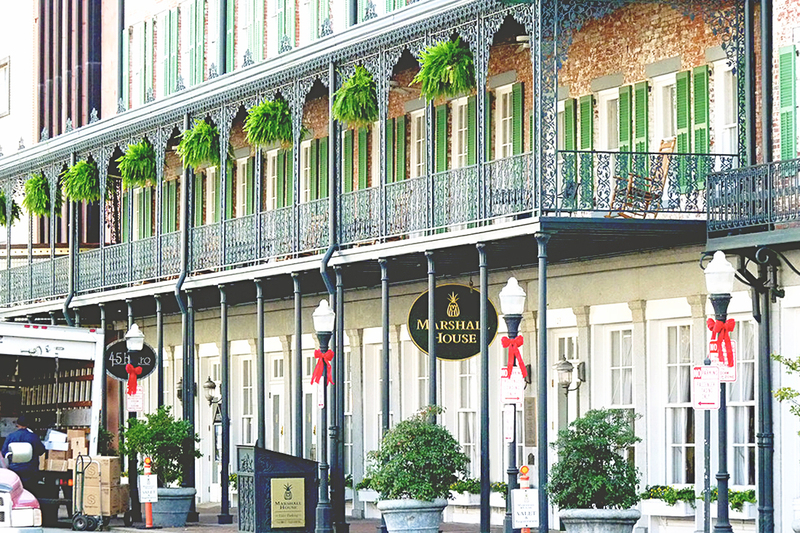 There are approximately 20 hotel options to choose from both on River Street and within a short walking distance to River Street. I've only listed options that fall between Broughton and River Street so you won't need a car at all. Andaz Savannah: This one is at the corner of Barnard & Bay Street, which is one street above the river. 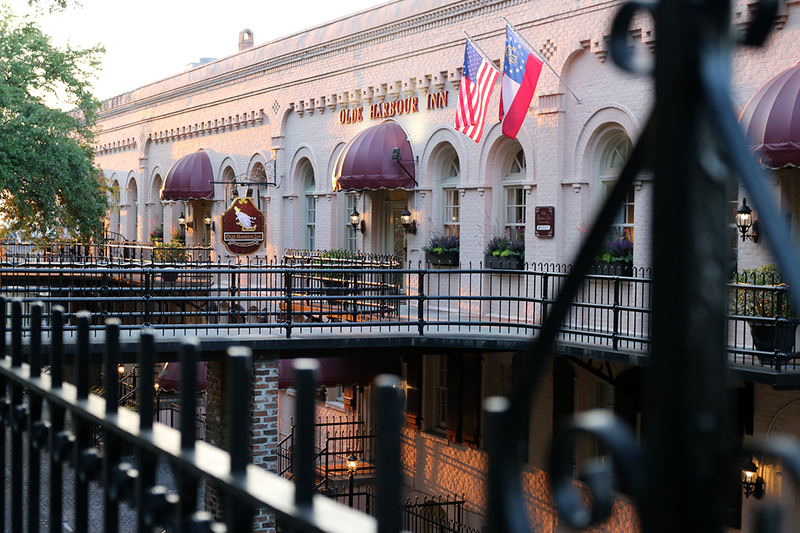 It won “Best Hotel” for 2 years running in Savannah's annual “Best of Savannah” poll. There's a pool and full restaurant on-site, and you'll be within walking distance of not only River Street, but also City Market and the local shopping mecca of Broughton Street. It's a Hyatt concept property, in case you're part of their rewards program, and has a trendy/modern vibe. The Andaz is a 2017 Gold Award winner on hotels.com, which means confirmed guests consistently rate it “exceptional”. Hilton Homewood Suites: This option is currently ranked #1 in Savannah hotels via TripAdvisor (of the options directly on the river). It's at the far end of River Street, so it's far enough from the bars that you won't be disturbed by the late night drinking crowd. It includes all the typical amenities Hilton offers (pool, gym, etc.). Be sure to join the Hilton Honors program to receive complimentary in-room wi-fi, discounts, and to earn rewards credits. This hotel is fairly new, so it's in fantastic condition. Homewood Suites is a 2017 Gold Award winner on hotels.com, which means confirmed guests consistently rate it “exceptional”. Ideal for: Families traveling with children, business travelers, everyone! 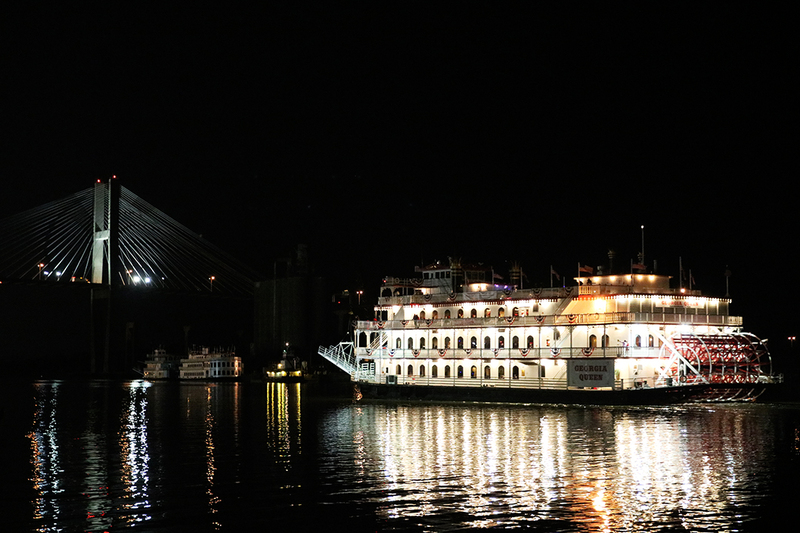 The rooftop bar at the Cotton Sail Hotel has beautiful views of the Talmadge Bridge and Savannah's Georgia Queen riverboat. Cotton Sail Hotel: The views from the rooftop bar are incredible — particularly for catching stunning sunsets behind the picturesque Talmadge Bridge. Many of the rooms have exposed brick and feel very authentic to Savannah. While there aren't many food options within the hotel other than tapas style bar food, there are numerous restaurants just steps away on River Street. Marshall House: This is one of the more well-known options near River Street — thanks to its inclusion on numerous top 10 lists of “most haunted places to stay” in the U.S. 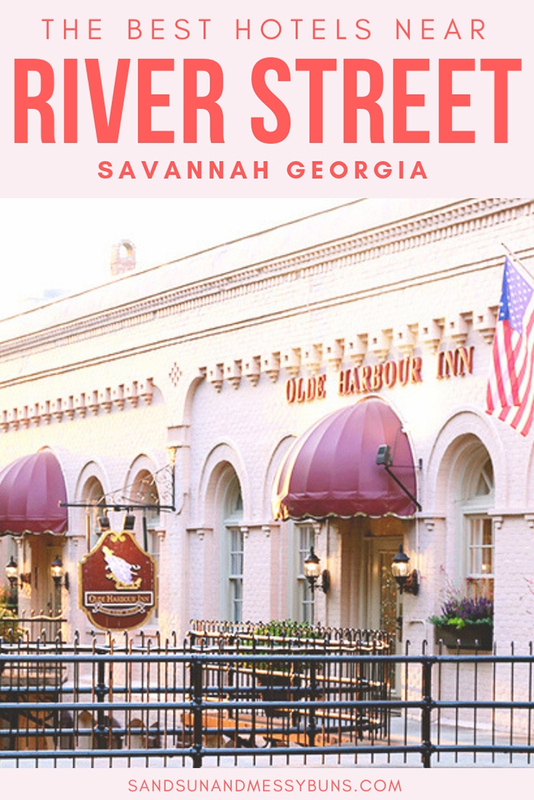 The inn is located on my favorite shopping streets in Savannah, but it's easily within walking distance to River Street. 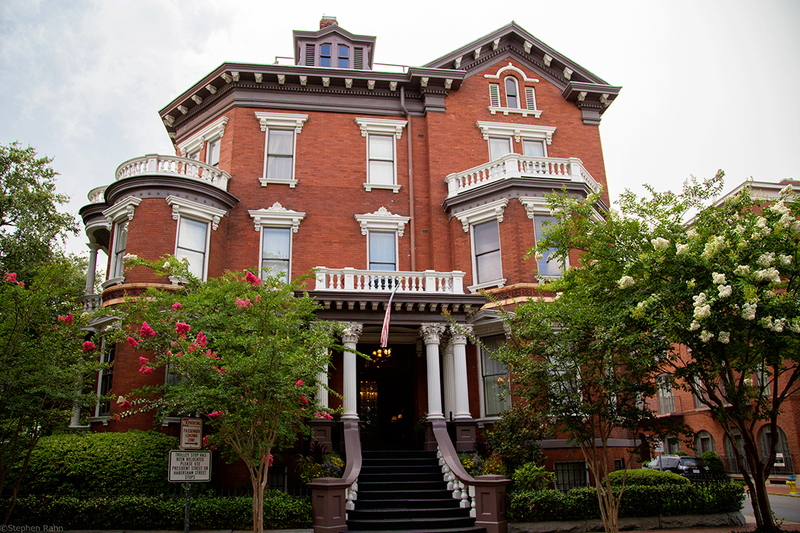 This is an iconic location in Savannah and you'll often find ghost hunting tours gathered out front. Marshall House offers a wine & cheese hour, and they bring in a historian a few times each week to answer questions about Savannah. Kehoe House: Completed in 1892, the lovingly restored Kehoe House is located next to Columbia Square — which is one of the more peaceful spots you'll find within walking distance to the river. The staff at this refined B&B is well-known for their southern hospitality and accommodating manner. The chef serves a cooked-to-order breakfast for guests each morning — and on a silver platter, no less! The decor feels very authentic to the time period in which the home was built. I suggest this option for anyone seeking a quiet stay and personalized attention. Kehoe House is a 2017 Gold Award winner on hotels.com, which means confirmed guests consistently rate it “exceptional”. The entrance to the Olde Harbour Inn on Factor's Walk is beautiful any time of year. It looks particularly welcoming with fall and Christmas decorations are on full display. Ideal for: Families traveling with pets! This option is pet-friendly. East Bay Inn: East Bay Inn is a very charming option on Bay Street. The staff gets high praise for their Southern hospitality, and I'm a huge fan of the exposed brick walls in many of the rooms. This one is also pet friendly and typically goes for around $150/night. Ellis Square Rental: This elegant rental is off Ellis Square, which is near City Market and Congress Street (lots of fun nightlife on Congress). It sleeps 4, has a full kitchen, and is very nicely decorated. I love the exposed brick walls. 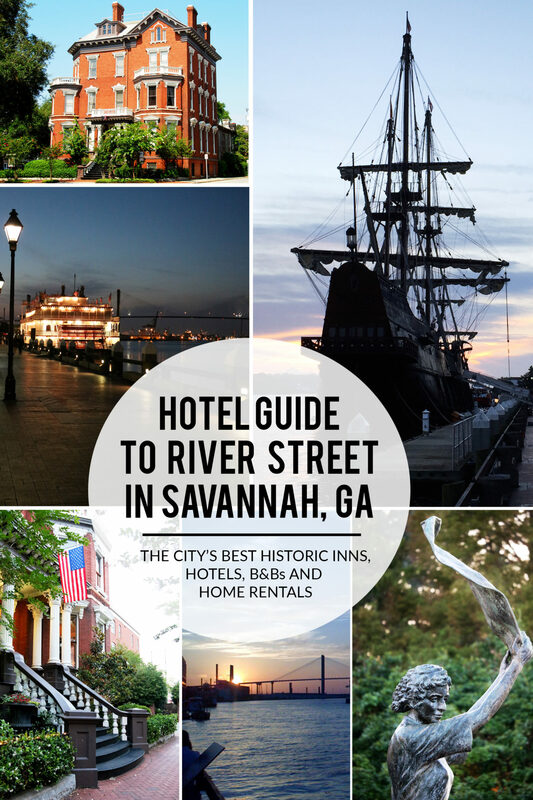 Related: The Ultimate Guide to River Street in Savannah, GA. I hope this post has been helpful — or that it at least provides a good starting point in your search. I'm always happy to help visitors share in my never-ending love for this beautiful city! Want more? Here's where you'll find all of my Savannah posts. Here's where you'll find my Savannah favorites on Pinterest. 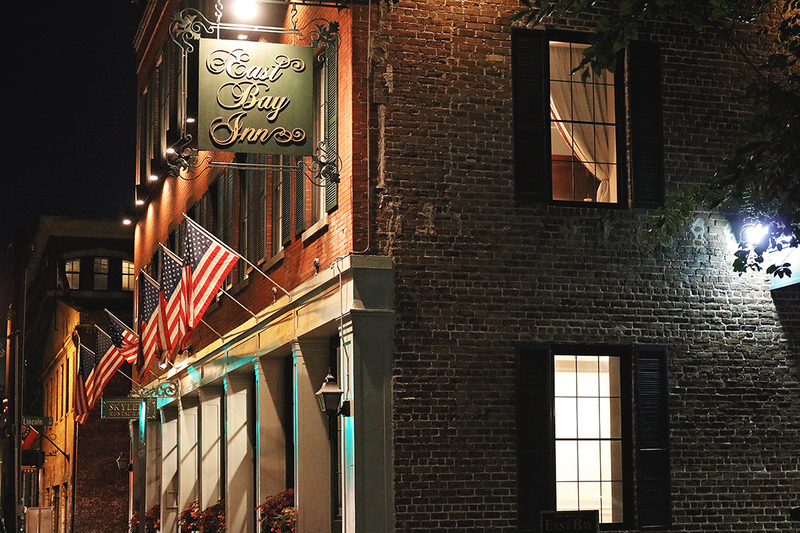 Ready to book a flight to Savannah? To find the cheapest flights from your city, search Google Flights to pinpoint the most affordable date for your travel, then search that date in Skyscanner to find the cheapest flight possible. This is incredible ! Thank you ! Where are the “must eat” places ? It’s incredibly beautiful. Jones Street, Gordon Street, Taylor Street are a few of my favorite spots to just walk around and look at the beautiful houses. And the Starland Arts district has lots of unique thrift shops! You’ve provided such a great resource, and yes, “You’re so lucky!” I’ve been wanting to visit Savannah for a while now…hopefully soon! I know…I feel lucky! It’s like a dream living here. 🙂 I hope you’re able to make the trip soon to see for yourself. Currently reading ITGOGAE for the second time and Savannah is on my to-go list. I know it’s so much more than the book, too. How’s the wheelchair access? The wheelchair access downtown is pretty good, but River Street is more difficult to navigate. Because it’s on a bluff and sits lower than the rest of the city, there are steep stairs to gain access to it. The Department of Transportation offers a shuttle from Bay St. & Drayton that drops off and picks up on River Street, so that or elevator access from one of the major hotels would be the best option. The Hyatt is very centrally located and you could enter from a car on Bay St., then take an elevator down to the River Street level. Also, just FYI, the majority of River Street is made of cobblestones, so it’s very bumpy. Those cobblestones are no fun when I’m on my bike. lol Let me know if you make it back to town…would love to meet you! These look so beautiful! I’ve always wanted to visit Savannah (probably since I read Midnight in the Garden of G & E which you linked!) so this makes me want to find a way to do it soon! I appreciate the ideas for different types of travelers – I have 3 kids so often look for family getaways but maybe in a few years I can start to look at holidays for just the hubs and me! Thanks!